“Hey, Let’s go to the Aeon!” I said to Satoru-kun. I remember it was a cold day on 23rd December 2000 when the Aeon Mall Kochi opened. I was only 12 years old then. On the way home from school and holding a 100 yen coin, I went there with my friends. We saw the mall from outside. It looked really big. We swallowed. Passing through the gate, we found a totally different world. “Wow, it’s warm inside! Very comfortable!” Satoru-kun said. The mall attracted me like Tokyo Disney land because everything was new, everywhere was clean. In addition, there were lots of fascinating shops for kids such as Toy store, Video arcade, book store, and MacDonald’s. We nearly got lost inside. I thought the mall was such a good place for hide-and-seek. From that day on, I often visited the Aeon Mall rather than Obiyamachi which is the central shopping area of Kochi city. 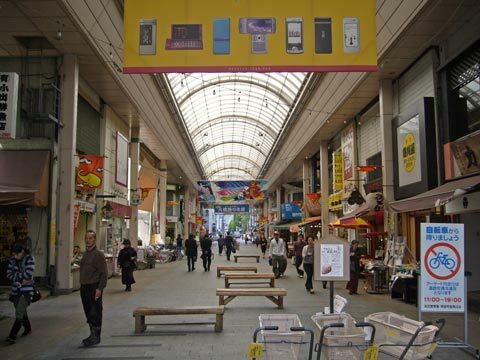 Obiyamachi has a shopping arcade called a shotengai. You can find shoengtai in almost every town in Japan. It is composed of local specialty shops such as grocery stores, vegetable shops, fish, tofu, clothing, book, and stationary shops. Roofs often cover shotengai so that customers do not need worry about rain. The customers enjoy not only shopping but also socializing with local shop owners. A 2009 survey of family income and expenditure in Japan reported 73% of people shopped at retail shops in 1964. However it dropped to less than 30% by 2009. The data indicate shotengai business has been stagnant. Some shop’s shutters are closed because they went out of businesses. In general this situation is a quite common almost all of shotengai. According to the center of Kochi city regional vitalization master plan, annual sales turnover in the central business district was 98,351 million yen in 1994. It constantly dropped to 46,106 million yen in 2007. In other words, the annual sales turnover in 2007 was half as much money as in 1994. In addition, floor space at the retail shops in the CBD also decreased between 1994 to 2007. In 1994 the floor space was 100,864㎡. However it shrank to 54,224㎡ in 2007. One of the main reasons why is considered to withdrawals of department stores and theaters from the CBD. One of the main reasons more and more Kochi people do their shopping at the big retail stores is the free parking area. Almost all shops in the suburbs have free parking area. On the other hand, the shops in the central area normally do not have free parking spaces. Even though they offer coupons for free parking, parking in the central area is still tiring because the parking places might be not close to the shops like the shops in the suburbs. Kochi city is motorized society. Therefore parking is a very important element for shopping. In addition, prices at the shops in the suburbs tend to be cheaper than at the central area’s ones. Thus, more Kochi people go shopping in the suburbs. 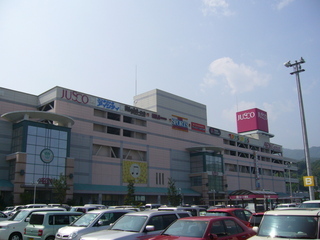 The number of Kochi people who go shopping in Obiyamachi has decreased since the aeon mall came up. Most people buy goods at the big shops located in the suburb. However, many people even now go to Obiyamachi because Obiyamachi has been keeping its unique attractions. One of the main Obiyamachi’s charms is local restaurants. Obiyamachi has a lot of local restaurants which offer alcohol drinks and local foods. When it comes to gathering with old friends or celebrating something, they inclined to have dinner in Obiyamachi. Besides, Obiyamachi is an entertainment district. There are many Japanese pubs, Karaoke shops. Even after having dinner, they stick around there to enjoy Kochi’s night somehow. Another attraction of Obiyamachi are festivals. Many festivals happen at Obiyamachi. The interesting thing is whole the area become festival places. Lately new festival has come up. 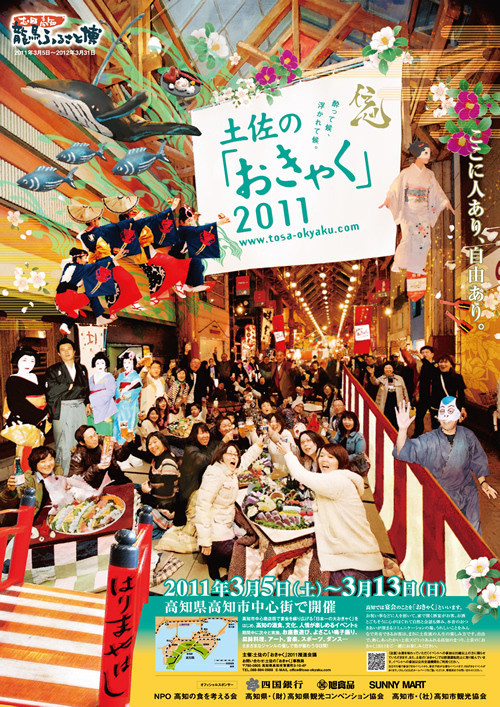 The festival’s name is Okyaku which means “feast” in Kochi dialect. In the Okyaku festival people put many tables and spread mats on the ground in the middle of the arcades. In addition, a lot of stands offer drinks and foods. People enjoy the Okyaku for several days. Even people who usually do not visit Obiyamachi, they are allured into exciting, friendly and unusual atmosphere created by Okyaku. During the festival, people interact actively with each other, which hardly happen at the big shops in the suburbs. One day, I got such a message from my old friend, Satoru, and visited Obiyamachi. That day was near the end of the year. The city was so crowded and exciting. 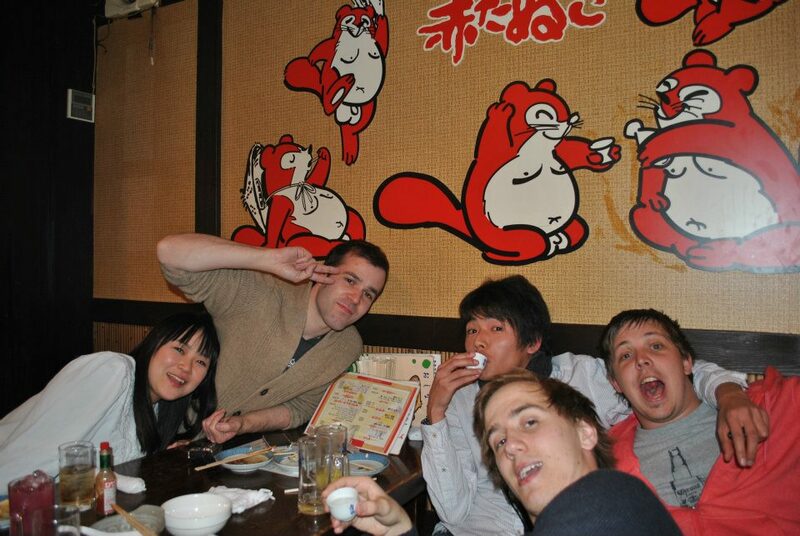 I had dinner in a Japanese pub and sang songs in a karaoke shop all night long. Nowadays fewer people go shopping at Obiyamachi compared to 20 years ago. But Obiyamachi continues to play an important role in the city. It has splendid local restaurants. Additionally amazing, unique festivals happen there. These parts cannot be copied by big companies from outside of Kochi. Kochi people love local restaurants and local festivals created by local people. As long as Obiyamachi hold the charms, Kochi people, including me, keep being attracted by Obiyamachi. Lately I do not go to the Aeon mall so often, because it does not attract me as much as it did in the past. I realized that type of the malls can be seen everywhere in Japan. The malls are standardized and some of them are nearly the same. I found that the malls are kind of boring places because they seldom reflect the local area’s colors. Of course, it is the convenient place for shopping, but it is not more than that, I think. I cannot say which place is better Obiyamachi or the Aeon mall. I would just say the functions are different. If you come to Kochi as a tourist, please visit Obiyamachi. If you want to buy something which is familiar to you, please go to the mall. You can find things as you expected. You can enjoy both of them, however it would be better to know the respective difference of the functions. Have a good life in Kochi!